Fortress Gate, Oil on Canvas, 30″ x 24″ ©Michelle Arnold Paine. Available at 20North Gallery. 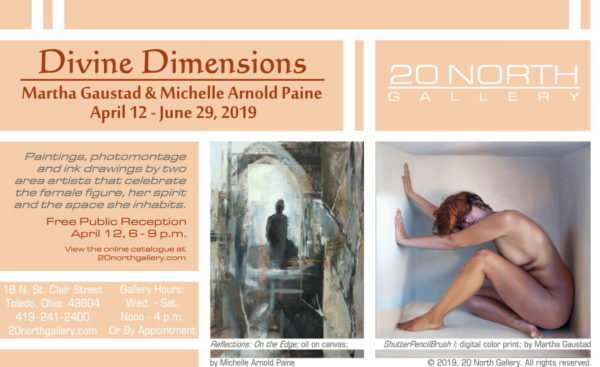 My figure drawings and architecture paintings will be featured in “Divine Dimensions”, a two-person exhibit at 20North Gallery in downtown Toledo from April – June 2019. The opening reception will be Friday, April 12, 2019 from 6-9pm. Both my figure drawings and my architecture paintings have been part of my studio process for many years. 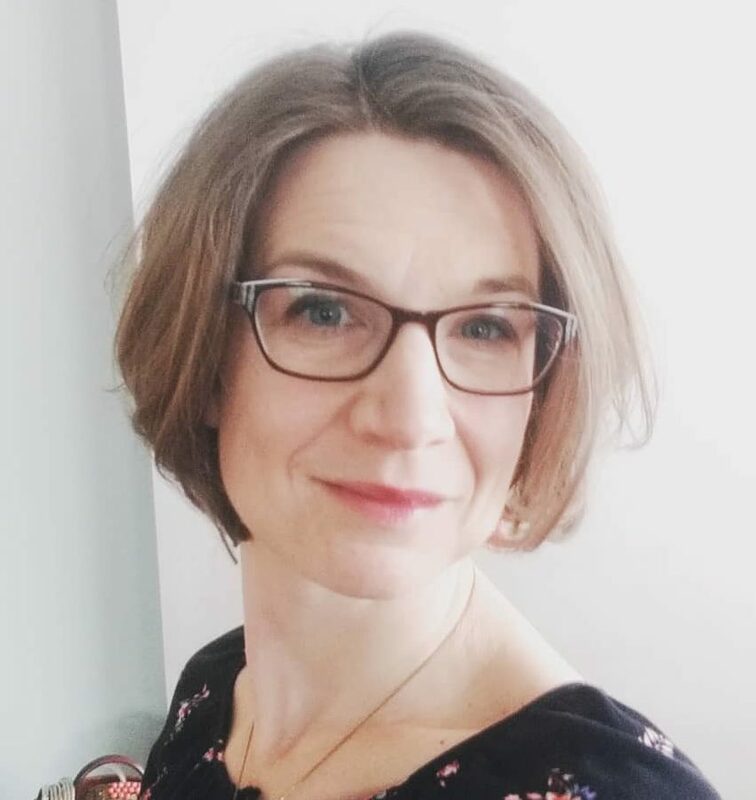 I am excited to have both bodies work exhibited together for the first time and explore how the different media and subject matter inform one another. After I returned from three years living and working in Orvieto, Italy, public spaces in the US felt desolate and utilitarian. While in graduate school, a professor at UNH suggested I paint my memories of Italy. 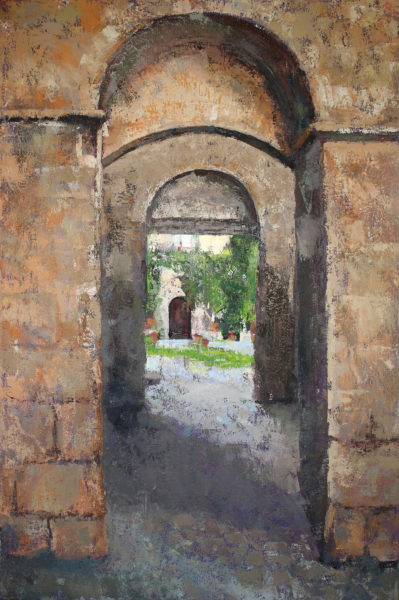 I embarked on more than a decade of painting my memories of Italy through exploring the atmospheric forms of medieval architecture in painting. The stone walls and gates of medieval Italian towns became a metaphor. The arches and the contrast of light through the opening symbolize looking forward to something bright and beautiful that I am only sometimes able to glimpse. The enveloping darkness of the archways represent looking back on the formative time I spent in Italy. Through painting I am trying to recapture the vision of creativity and possibility that was planted in that time. 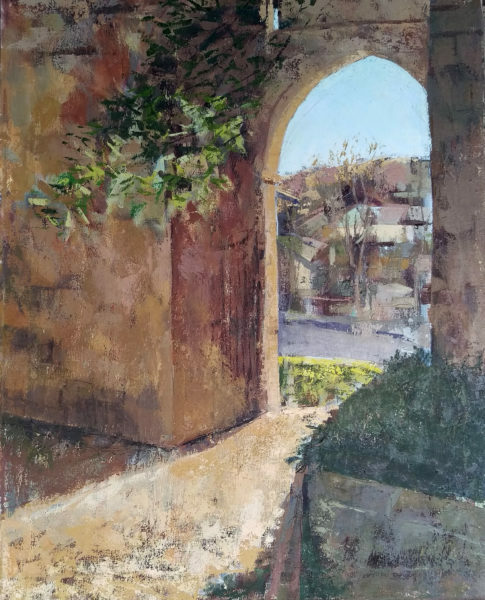 Bagnoregio Courtyard 2, Oil on Canvas, 30″ x 24″ ©Michelle Arnold Paine. Available at 20North Gallery. The philosopher Martin Heidegger links architecture with the old German word “bauen”, which meant dwell: to be on the earth and under the sky. This state of existence between earth and sky has both physical and spiritual dimensions. It suggests that our earthly dwelling, our interaction with the specific space in which we live, is not purely utilitarian but has a significance which relates to our very essence as human beings. In medieval architecture, I feel this concept of dwelling take shape as an awareness of the divine. I sense that the architects built these spaces to be visible, tangible expressions of divine presence, between earth and sky, intended to foster an encounter between heaven and earth. Like the cathedral builders, or Impressionist painters like Monet (whose Rouen cathedral paintings did not have the cathedral as their true subject, but rather the invisible light and air), I seek to use paint to articulate something that is without color or form. Like the structures that inspired them, in my paintings, image layers image, sometimes sanded or scraped away. The painting itself becomes a palimpsest of history like the ancient buildings, addressing the tension between the permanent and the passing. My paintings express my desire to explore the edge between visible and invisible, past and present, spiritual and physical. Looking into Shadows, Walnut Ink on Paper, 10″ x 7″ ©Michelle Arnold Paine. Available at 20North Gallery. My drawings also walk this edge between past and present, spiritual and physical. I explore with pen and ink the ephemeral nature of emotion and breath, our experience of the transcendent through being physical creatures. Through drawing the figure I experience the brevity and mutability of life. The unpredictability of ink and a model posed for a few minutes emphasize our fleeting presence on earth. These drawings dialogue weekly with my studio paintings of medieval architecture, structures originally intended in some way to fend off our mortality. 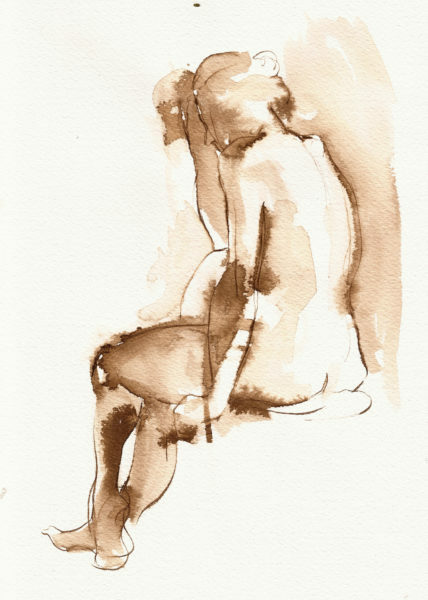 Female Figure with Hands on Hips, 10″ x 7″, Walnut Ink on Paper ©Michelle Arnold Paine. Available at 20North Gallery. The drawings are expressions and explorations of the connection between mind, body, and spirit. They are a representation of the wholeness of the human person. As I sit in the presence of the model I grow in an awareness of vulnerability and humanity of this person over a period of time. This project is partially funded by an Arts Commission Accelerator Grant made possible through support from ProMedica and the Ohio Arts Council.